The man accused of murdering rapper Nipsey Hussle has had his bail set at more than million (£5.3 million). Eric Holder was taken into custody by Los Angeles County Sheriff's officials in Bellflower, California on Tuesday (02Apr19), hours after Los Angeles Police Department (LAPD) chief Michel Moore urged the 29 year old to turn himself in during a press conference. He has since been transferred to an LAPD jail, where his bail has been set at just over million. According to The Blast, Holder is being held separately from other inmates over concerns for his safety, as authorities are aware "lots of people don't like him right now". He stands accused of gunning down Hussle, 33, outside his Marathon Clothing store in Crenshaw, Los Angeles on Sunday (31Mar19). The hip-hop star and activist, real name Ermias Davidson Asghedom, was pronounced dead after being admitted to a local hospital. Investigators believe Holder had a personal dispute with Hussle, and claim his death had nothing to do with gang violence. 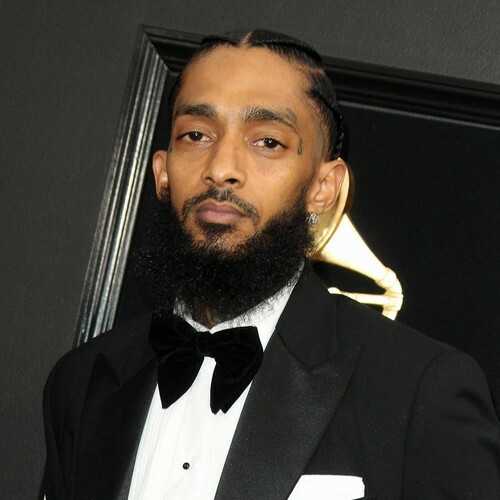 The suspect's arrest took place shortly before Hussle's longtime girlfriend, model Lauren London, broke her silence to mourn his tragic passing. "I am completely lost," she wrote on Instagram. "I’ve lost my best friend My sanctuary My protector My soul... I’m lost without you We are lost without you babe I have no words." Lauren and Hussle, who had been dating since 2013, shared two-year-old son Kross, a half-brother for the rapper's daughter Emani from a previous relationship, and the beauty's nine-year-old son Cameron, from her romance with Lil Wayne. Following her heartbreaking post, celebrity friends including Ciara, Gabrielle Union, Jill Scott, Evan Ross, Jennifer Lopez, and Alicia Keys reached out to offer their support. "Sending you love and praying for God to give you and your family all the strength you may need during this time," wrote J.Lo, while Alicia commented, "Soulmates forever! We are all Sending you, your babies and your family the brightest most protective and loving collective unified light beautiful sister (sic)".